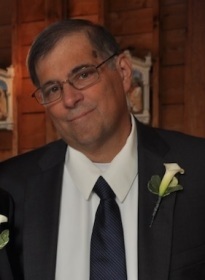 James Thomas Shaker, 59 of North Adams, MA died on April 22, 2018 surrounded by his family. He was born in North Adams, MA on November 15, 1958 son of David A. Shaker and the late Wanda (Ellis) Shaker. Jim attended local schools and graduated from Drury High School with the class of 1977 and received his bachelor's degree from North Adams State College. He was last employed as the general manager of Greylock Bowl & Golf and Mingo's Restaurant in North Adams. Jim also worked as a referee for high school basketball and youth sports games and served as a statistician for Drury High School basketball. Anyone who knew Jim, knew he loved spending time with his family, especially his bright and shining star, granddaughter Elena. He was an avid sports fan, especially the Red Sox, Celtics, NY Giants and USC Trojans. Enjoyed the family poker games, trips to Las Vegas, and playing in the Adams and North Adams softball leagues. Survivors include his wife Lillian (Alvarez) Shaker of 35 years, the love of his life whom he married on September 11, 1982; and three sons – Matthew, Jason (wife Lisa) and Kevin, and his father, David A. Shaker of Boca Raton, FL. He also leaves his beloved granddaughter - Elena, two sisters – Debra Wiencek (husband Tom) and Diane Shaker Heard (husband Rick) along with four brothers - David (wife Karen); Richard (wife Louise); Robert (wife Terry), and William Shaker (wife Kate) along with numerous brothers and sisters-in-law, godchildren, nieces, nephews and cousins. Thank you to Berkshire Medical, Baystate Medical, Williamstown Commons and the Dialysis Centers. Jim received great care and support from all the staff members. Funeral Notice: Calling hours are Wednesday, April 25, 2018 from 8:30 AM to 10:30 AM at Flynn & Dagnoli-Montagna Funeral Home, West Chapels, 521 West Main St. North Adams, MA. A Liturgy of Christian Burial for Jim Shaker will be celebrated immediately following at 11:00 AM at St. Elizabeth of Hungary Church on 70 Marshall Street in North Adams. Burial will be private. Memorial donations may be made in Jim’s memory to the North Adams Youth Basketball Scholarship Fund- P.O. Box 747, North Adams, MA 01247. To add to the Book of Memories, please visit www.flynndagnolifuneralhomes.com.